► Super Durable Parachute cord with "Monkey Fist" design Inspired parking aid you will enjoy the design and eye pleasing colors of the parking aid hanging in your garage. Made from tough Parachute cord individually assembled and packaged. ► Park in your garage with confidence and safety. Take the worry out of parking your automobile and that the garage door will not cause damage when it's closed, ensuring your not parked to close to objects in front of you. ►Installation is easy as ever and everything is included with no product assembly, additional gadgets to hang or batteries to replace. We've designed the BALLPAHK parking aid for quick installation. 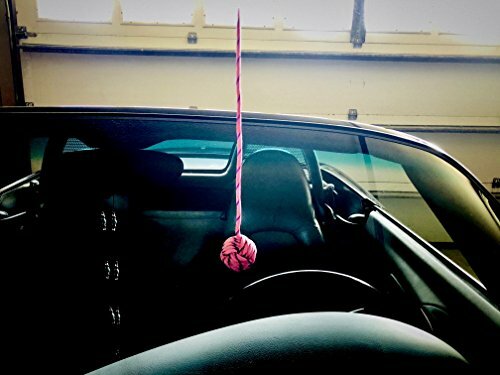 Just screw the hook into the ceiling above the windshield, hang the ring on the hook and adjust cord to the proper length to meet the windshield, it's as easy as that. Purchase a new automobile simply re-adjust the cord and continue to enjoy the BALLPAHK parking aid. ►Bright multi colored design makes it visible and is pleasing to the eye The colors have been chosen and tested to stand out in most light situations. And when your automobile is not parked in the garage, it's not unsightly to look at. ►Perfect as a gift - Give BALLPAHK as a gift to your family, friends and gadget lovers to enjoy the design, confidence and safety features of this product for years to come. GARAGE SAFETY - Park in the same spot each time you enter the garage for safe closure of the garage door. HIGH QUALITY & GREAT LOOKING - Durable Paracord rope and hardware for long life. NO TOOLS REQUIRED - Installs in just minutes with the provided quality hardware. NO TENNIS BALLS or electronics to deal with or assemble | just hang and enjoy. If you have any questions about this product by BallPahk, contact us by completing and submitting the form below. If you are looking for a specif part number, please include it with your message.